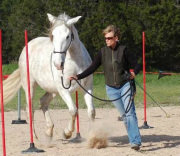 Performance Standards - Equine Agility - It's like dog agility only with horses! Horse must enter by stepping up onto the the Teeter Totter from the front and walk with forward motion with all four feet upon the Teeter Totter at all times. Horses must then exit the Teeter Totter by stepping off from the opposite end. If the horse should steps off the side of the Teeter Totter on either the right or left side, the horse and handler must go back to the front of the obstacle and start over. Horse and handler must weave through every Weave Pole in the series. If a Weave Pole is knocked over, or the horse misses a Weave Pole, then they must return to the beginning of the obstacle and start over. Horse must go through the Weave Ladder from the front entrance and work their way through. If the horse knocks boards off the Weave Ladder while moving forward, they must repeat the obstacle from begining. Horse must pass over each Cavaletti in the series without knocking any over. If a Cavaletti is knocked over, the horse must return to the beginning of the Cavaletti's and repeat the obstacle series again. There are a variety of different choices for the Pedestal obstacle. 1.) Step both front feet up onto the Pedestal and rotate a complete 360 degree circle. If the horse comes off the Pedestal they must repeat the obstacle. 2.) Step up with all four feet onto the pedestal, again if the horse's feet come off the Pedestal before the horse is settled, then the obstacle must be repeated. 3.) Step up with all four feet and then rotate a complete 360 degree circle, if any of the horse's feet come off the Pedestal, the obstacle must be repeated. 4.) Step up with all four feet, step front feet down, pivot around 180 or 360 degrees with front feet while with back feet remain on Pedestal. If any foot/ feet come off the Pedestal the obstacle must be repeated.